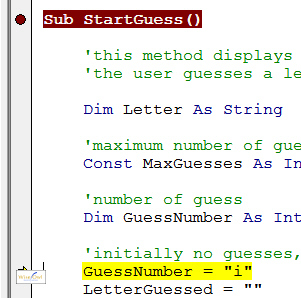 In VBA terms, we say that the class (which we'll call clsLetterGuess) exposes the property and method shown above. 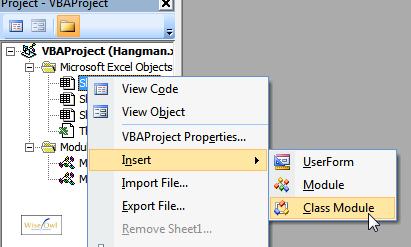 Right-click in Project Explorer and choose to insert a Class Module. You can press F4 to bring up the Properties window, and overtype the Name property. Your new class appears in the list of objects available! This wouldn't happen if you made the variable Private, as its value wouldn't be exposed by the class to the outside world. MsgBox "You must type in one (and only one) letter"
MsgBox "Not a valid letter"
Note that we've added a constant called Letters for the class to hold the alphabet (the allowed letters). At the end of running the method StartGuess above, LetterGuessed will either hold a valid letter guessed, or an empty string. You can only see properties and methods (collectively called members) which are publicly exposed. Stop snickering at the back - yes, you really can talk about class members being publicly exposed! Here our code has crashed - I wonder where? The code crashed on this line. The real culprit: we're trying to store a letter in an integer variable, but you can only find this out by stepping throught the code. 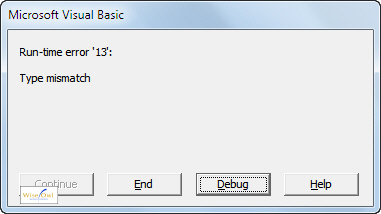 An alternative approach is to change your VBA settings to allow code to break within a class module: from the VBA menu select Tools --> Options, click on the General tab and select the obvious error trapping option. The price you have to pay, however, is in writing and testing the properties and methods in the clsLetterGuess class. Classes are ideally suited to a situation where you have a small team of expert programmers to create classes, and a larger team of less expert programmers who will want to use them over and over again.